This isn't your typical pay-at-the-gate attraction. In fact, there is no admission charge — it's free! Some you might not even call it an attraction, but don't say that to the locals of Lake Wales, Florida. Spook Hill is proudly recognized by the town. The "thrill" of the attraction is your vehicle seems to coast uphill. Is it a weird phenomenon, optical illusion or the unrest of spooky spirits? Well, the legend is that it's spooky spirits. After the Seminoles left the Cherokee nation, they settled in Central Florida. One legendary chief, Cufcowellax, settled on the lake which is now known as Lake Wales. After several years living in peace, a bull alligator began harassing the tribe and soon began nightly raids on the village, causing fear among the tribe. The brave chief set out to conquer the evil spirit. When he did, the tribe noticed a small lake had formed near the big one. They named it Lake Ticowa. Eventually, the Indians lost their camping grounds to the invading white settlers. Circuit riders carrying mail between the coasts used the old trial around Lake Ticowa until they noticed their horses laboring downhill. It was those circuit riders that first called the place Spook Hill. As the area developed and the citrus industry grew, the hills around Lake Ticowa were covered with citrus groves. As workers would drive their wagons around the lake, they would find their mule teams struggling downhill with a load. A sign was erected that states, "Many years ago an Indian village on Lake Wales was plagued by raids of a huge gator. The Chief, a great warrior, killed the gator in a battle that created a small lake. The chief was buried on the north side. Pioneer mail riders first discovered their horses laboring downhill, thus naming it "Spook Hill." When the road was paved, cars coasted up hill. Is this the gator seeking revenge, or the chief still trying to protect his land?" 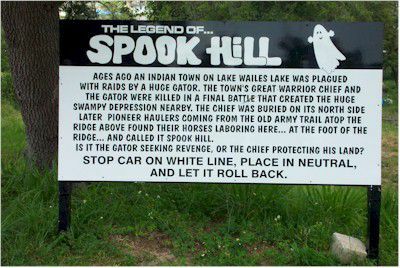 Spook Hill is located on Dr. J A Wiltshire Avenue East, Lake Wales. From Orlando: Take I-4 West to Hwy. 27 South. Turn left onto Hwy 17/North Scenic Highway. Turn left onto Dr. J A Wiltshire Avenue East. Turn left at dead end. The attraction sign is on your right across the street from Spook Hill Elementary. From Tampa: Take Hwy. 60 East to South Buck Moore Road and turn left. Turn left onto CR 17A/Burns Road. Turn left at the signs just past Bok Tower. Follow the signs to the attraction.